Hublot CEO Ricardo Guadalupe recently made a short visit to Australia, his first visit here. In conjunction with Ferrari Australia, Mr Guadalupe launched the new Big Bang Ferrari models at functions in Sydney and Melbourne at each city’s respective Ferrari showrooms. 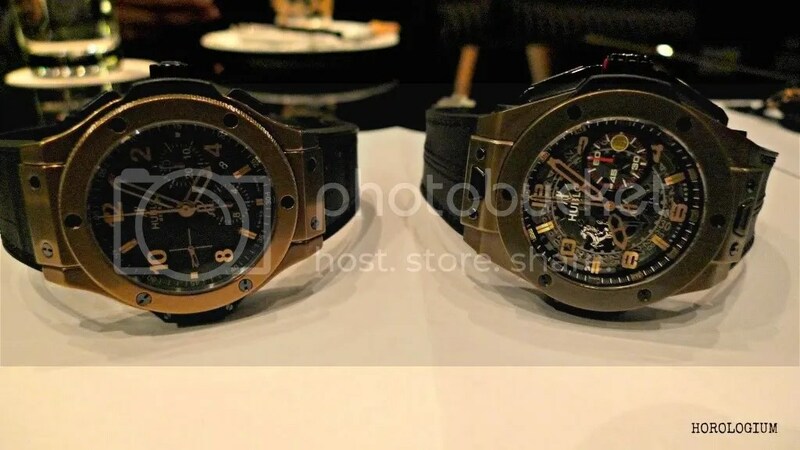 The CEO of Hublot since the beginning of this year, he has been at Hublot since 2001 and worked with Hublot’s Chairman and former CEO Jean-Claude Biver for almost two decades. It was during his time in Sydney that I had the opportunity to sit down with the engaging Mr Guadalupe. 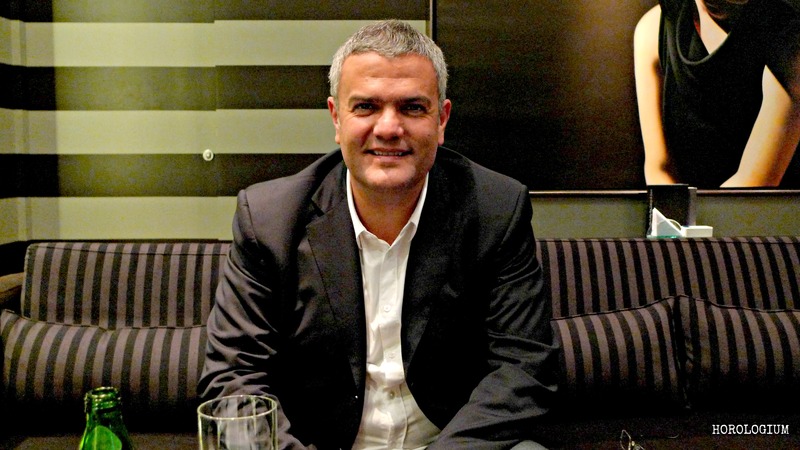 Horologium: You’ve now been Hublot CEO for just over half a year. Under Mr Biver as CEO, the well-known catchphrase of Hublot was ‘fusion’. Is ‘fusion’ continuing, or will there be a new direction under your leadership? Ricardo Guadalupe: No. Fusion, looking to the future, is what Hublot is about. You shouldn’t change a good thing. When you establish a concept for a brand and a strong message like ‘art of fusion’, I think that it is something that will remain forever. 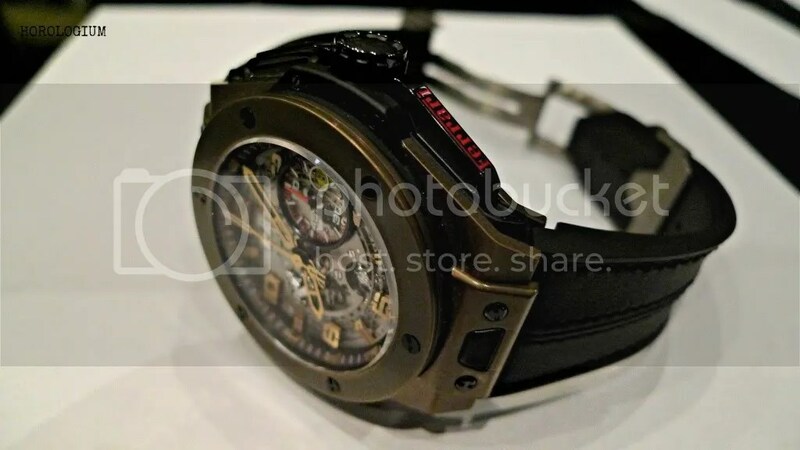 Hublot was the first brand to come up with this sort of a concept. Before, you had brands with more classic traditional concepts, and Hublot came up with a vision of respecting the past but making watches that connect you more to the future. 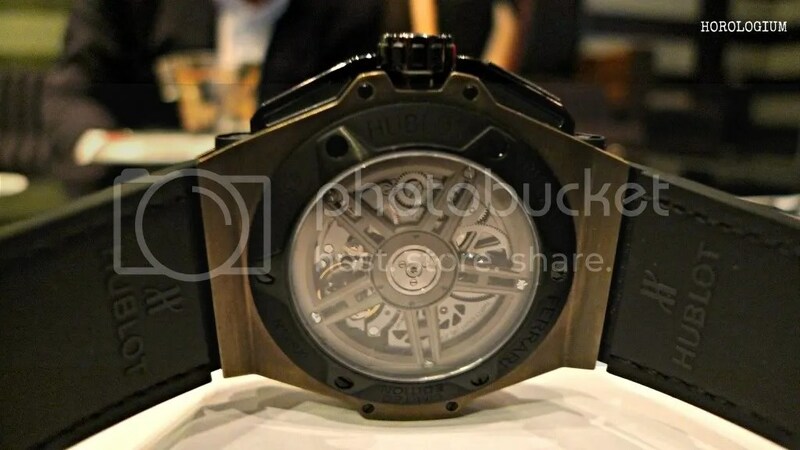 The first was rubber and after that, materials such as ceramic, carbon fibre, and now Magic Gold, a new material that is really an invention that has been created by Hublot. H: I’ve read that Hublot’s five year partnership with Ferrari will be a relationship that goes beyond being the ‘official watch and timekeeper of Ferrari’ and co-branded watches, and cover joint research into new technologies and materials, as well as Hublot designed portholes on the Ferrari dashboard. Could you give me an idea of what is in store for Hublot and Ferrari? RG: Normally when we do a partnership, we try to do a long term partnership. This one is a minimum of five years and renewable for five years afterwards. The idea is to stay with Ferrari for many years, maybe even ten to fifteen years, to have a partnership where we really do things together. It is not just about doing a licensed product where we put the Ferrari logo on the watch and that is it. We are working really closely with the head of R&D and the head of design at Ferrari, and we have collaborated to create for example, this watch (gesticulates to own wrist. See photo below), whose influence came from the 458 Italia model. We have worked together about the design of this watch, and you have all details of the elements which come from this particular car. We are now working with them on a new Enzo model watch. We are at the beginning of this process (looking at drawings) but are matching the philosophy with the car with the philosophy/ DNA of our watch. H: You have just launched a new Big Bang to celebrate 20 years of Ferrari in Mainland China. A month or so ago China’s GDP numbers indicating economic growth falling to 7.6% in the June quarter, the slowest rate in three years but in line with market expectations. What percentage of your sales are in China? With China such a vital market for the watch industry, what’s Hublot’s approach when hearing about any signs of slowing down or uncertainty in such a major market? 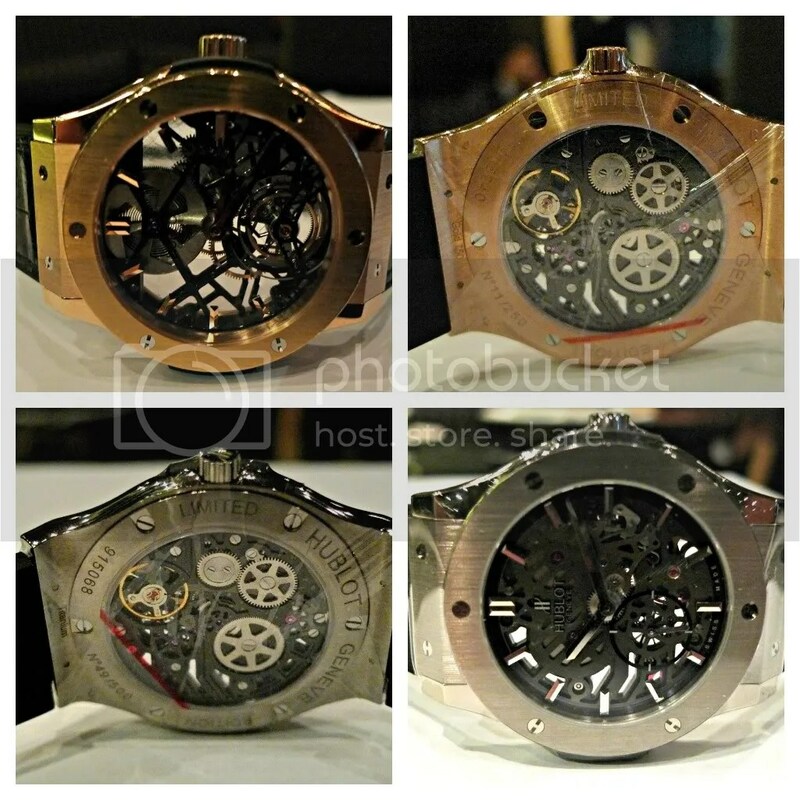 RG: Hublot is a young brand. It has only been in the last 6-7 years that we’ve had an incredible amount of success. Being a young brand, we didn’t enter China a long time ago. We are one of the youngest brands in China, and have only been present there for 2.5 years, so China is not the most important market for us today. Greater China (I would include Hong Kong and Macau) is important but it only represents 6% of our sales today. As for the watch industry, I think it is 32-33% for Greater China. This means that we still have big opportunities for growing in China. We are very innovative and different in our concept and still have to educate the consumer in China about the brand. We are at the beginning of the process; every month we see an increase, but it [GDP] doesn’t matter for us at the moment because of our low percentage. We are working on brand awareness in China and our partnership with Ferrari is important because we believe that Ferrari brings us the prestige for our brand; Ferrari is an iconic brand known all over the world and is very important for our strategy of building our brand in China. The Chinese still like the classic three-handed watch the most. RG: Maybe twelve. We currently have six stores. How do we expand in China? I think that China is a different market – there is not really a multi-brand network which is strong enough at our level to have a brand like us, so we will expand through mono boutiques. We are going to open in different cities but we are a strong brand and want to approach the brand with a strong positioning. H: What are Hublot’s plans for Australia? Is the Australian market any different to any of your other markets? RG: I have been in the business for 23 years and Australia has never been a huge market for watches, but it is evolving, and step by step people are understanding more about watches, about complications. The market is growing. We have five points of sale in Australia now. We are doing quite well; we might be able to open maybe two or three more points of sale in the next year or so? There is potential. The limit is probably around ten points of sale for a brand like ours. H: Research and development are very important to Hublot, such as the Magic Gold scratch resistant gold alloy. How many projects are you working on at any given time in R&D? RG: We are working on two main pillars in our R&D. From one side we are trying to do research into movements e.g. the UNICO movement which is in the BB Ferrari and which has been totally created, developed and produced in-house at Hublot. The work for this started in 2008; to create a new calibre, especially a chronograph, is a big investment in R&D. We are trying to create on the base of the UNICO – new complications such as the World Time this year, and we will work on new evolutions of complications such as maybe an annual calendar but not a traditional annual calendar with an interpretation in a new way. For our ‘material’ side we will try to be leaders in innovation. We are working on several different projects and working with the University of Engineers in Lausanne, financing a chair to undertake work in metallurgy. We worked with a doctor of metallurgy on Magic Gold and he has now come to work with Hublot and is now implementing (because to come up with the material is one thing, to industrialise it is another) how we can create more watches out of it. H: I understand that ‘Magic Gold’ is a scratch resistant alloy which will never oxidise. The Cermet in this Bullet Bang that I’m wearing is also a scratch resistant alloy which will never oxidise or corrode – could you please explain the difference? RG: The Cermet – we start from ceramic powder, which is the base material whether to produce Cermet or Magic Gold. We add the metal to produce the bronze colour…they are similar. Instead of putting traditional metal for the Cermet we have put gold in the Magic Gold. When you use traditional gold you put a lot of copper to achieve ‘red gold’. Here, we have only put ceramic (750 parts gold, 250 parts ceramic = achieve 18ct gold). H: With the new Magic Gold, is there perhaps a jewellery line in Hublot’s future? RG: With Magic Gold what is fantastic is that it is material that can be used for other components or products such as jewellery. Yes sure, why not, but we are in the process of implementing the industrial process at the moment. To produce Magic Gold is totally different. We are working with new types of machines; if you visit our factory you will find machines that are not normally in traditional watch brands. You need big ovens to compress at 2000 bars the gold within the ceramic, you need ultrasonic machines to create holes…so it’s not a traditional method. We are still a way from any other projects using Magic Gold, perhaps a few years away. H: Mr Biver has been long known for having a ‘second love’, his cheese. Is there anything (cheese, wine, a hobby) that is your ‘second love’? RG: My passion is watches. Almost all my time is taken up with this passion at the moment. The other passion which I would say I have is cooking. I like to cook and also like good wine. When I’m at home, I like to cook for myself and friends, and to discover different cooking through my travels. I like to eat very good meals, original meals and of course with a nice glass of wine. I think that there are some similarities between cooking and watches – taking care of detail, the quality of the product, to be really accurate. We have good friends, like Philippe Rochat was a three star Michelin (now retired). The new chef is also a friend. Also Guy Savoy in Paris. The Big Bang Ferrari Magic Gold on Mr Guadalupe’s wrist? Containing the UNICO movement, it’s the 500 piece limited edition Ref. 401.MX.0123.GR. The polished Magic Gold case has 6 H-shaped black PVD titanium screws, micro-blasted and polished black PVD titanium crown and pushers. There is an engraved Ferrari logo with red lacquer on the pusher at 4 o’clock. The Ferrari references are also via the rhodium-plated Ferrari prancing horse appliqué on the dial, and a minute counter hand with Ferrari red coating. The hands are also Magic Gold, and the deployant clasp is satin-finished titanium with carbon insert. As well as the BB Ferrari Magic Gold, there were a couple of other horological companions. The Hublot Classic can be forgotten amidst the Big Bang publicity. These are the Classic Fusion Skeleton Tourbillons, thinner and more elegant than their bolder siblings, and much more accessible from a size perspective as well. They come in Titanium and King Gold, both in a limited edition of fifty pieces. I’d like to extend my thanks to Mr Guadalupe for his time during his very brief trip here, and to Joel Ruiz from Swiss Prestige for making it possible. Great interview! Keep ’em coming!! It’s so nice to read about a CEO of a watch brand who is himself very passionate about watches, and not just about his brand, but to acknowledge the classics out there. Very impressed! It was a great pleasure to meet him and yes, that bit was pleasantly unexpected.